My Halloween trip today was a nice visit this afternoon to the yarn store. 25% off for some rather bright red and blue for scarves (more scarves???) and some Christmas yarn, no details, shhh, it's a secret. 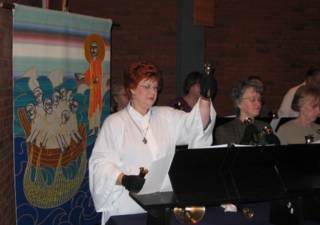 It was fun playing bells at church this morning, but my cold meant I didn't really want to hang around, so we left right after church was over and came home. Someday this cold is going to leave me, I just know it. 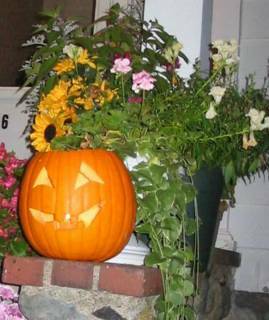 The front door is open, the jack-o-lantern is lit, the candy is in the bowl, and we're ready for the trick or treaters. It is warm tonight, almost 60 degrees, so it is a great night for the kids to be out. Being at the end of a dead end street means that we don't get a lot of trick or treaters, but we are at the ready! Mike and Michelle are home safe from New Orleans and it sounds like they had a great time! Woot! Woot! Three million people came to say thank you. 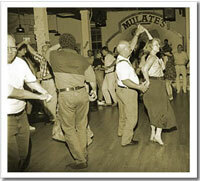 This is the last picture or article about the Red Sox. While riding in the duck parade, Pedro got hit on the head by a baseball today that someone threw from the bank of the river. No one can explain why it was thrown, much less who did it. 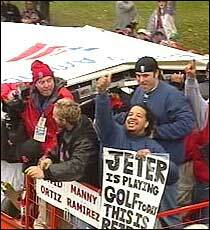 But Pedro is fine, and the rally is over, and we still won the World Series. 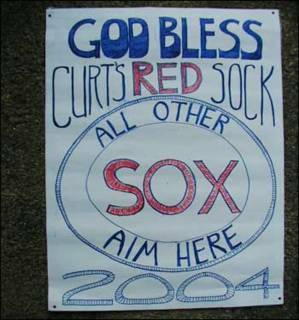 Curt Schilling showed up on crutches and will be operated on Wednesday, but we still won the World Series. I should have named this blog Red Sox Fever, 90% Red Sox, 10% Life. Life is not normal when you have a World Series team in your town, and some really tense and important games to think about while you do your mundane every day chores. It has really been fun. Today was cool and misty, but it did not rain out our parade. After it was over, it was hard to think about what to do next. It is going to be a long time before spring season and the next baseball game. Thanks to the Red Sox for a couple of weeks of stunningly good fun and exciting times. We swept 'em. No more tense nailbiting game watching. Now it is time for a long nap. Thanks to you all for reading about our own bunch of lovable idiots, and forgive me if I went a little overboard. I couldn't help it. 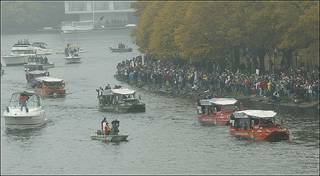 Red Soxs parade goes to the Charles River. Jeter is playing golf today, This is better! Manny's sign given to him by a fan at the Boston parade this morning. 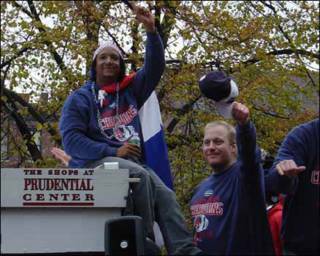 PARADE UPDATES: Pitchers Curt Schilling, Pedro Martinez, Derek Lowe, and Tim Wakefield are waving to the crowd and holding signs saying "Idiots Rule". They are signing hats and other gear that fans are throwing to them. The roaring crowds along Boylston Street are huge, at least 10 to 12 deep. On board one duck boat are World Series MVP Manny Ramirez, DH David Ortiz, shortstop Orlando Cabrera, first baseman/outfielder Kevin Millar, and first baseman Doug Mientkiewicz. The boat behind them is carrying GM Theo Epstein and manager Terry Francona. The local news is reporting that Schilling says ''While I am a Bush supporter, and I did vote for him with an absentee ballot, speaking as I did the other day was wrong. While I hope to see him re-elected, it's not my place, nor the time for me to offer up my political opinions unsolicited,'' the e-mail read. He cancelled a public appearance with Bush in New Hampshire for today...saying that his doctor needed to look at his ankle. First things first, Curt. The comment he made "vote Bush" sure took me back the other morning, and he had so many fans of all persuations, I just thought it was very bad form to actively campaign when he was being interviewed as a Red Sock. 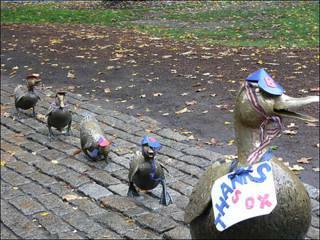 The parade is tomorrow and George has decided to go, and be a part of the two million people lining the streets of downtown Boston. I have decided I cannot go because of my cold/cough/misery that I am trying to recover from. 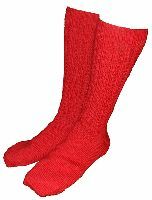 I think I will sit home and knit a pair of Red Socks for Michael for Christmas instead. Good idea! The World Series is over and now we can get back to our lives. The local newscaster says he is going to spend the weekend trying to catch up on sleep and clean house. I know the feeling. For several nights I was awake late watching a game, and then coughing through the rest of the night, and still trying to get to work each morning dispite my bad cold. I'm feeling a lot better today, as is the rest of Boston I guess. On to "life" stuff like carving the Halloween pumpkin, reading the mail, doing laundry, cleaning house, actually cooking dinner instead of ordering out, and maybe even watching a movie or logging into Everquest. Sounds like fun. Biting one's fingernails while watching another baseball game? Not fun. They wrote this week that Curt Schilling is no stranger to the red light of the camera, and likes to talk to reporters. I think he has proven that this week many times. But on ABC America this morning, he surprised everyone, his wife Shonda, and especially me when he said , "Remind everyone to vote...and vote for Bush". Ahh Curt. Pedro was a happy camper throughout the game, long before any of us could actually BELIEVE. Sox WIN THE WORLD SERIES!!! Boston is in a holy uproar and the Sox WIN!!! No one believed it could happen. Cautious optimism was thrown right out the window. We won. George and I were still holding our breaths in the eighth inning last night, and finally in the ninth I had to leave the room the suspense was so great. I peered around at the TV from the next room and when the final out was made it was really finally over! We won! George and I wore our red sox shirts over our pajamas and we jumped around the room like idiots. 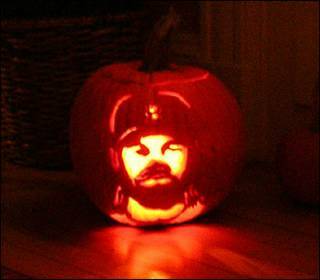 I don't think I could have taken another night of terror-stricken baseball until the witching hour. Last night, there was an eclipse of the moon that we could see clear as a bell from our front porch. At the middle of it, the moon was red and white. A red sox moon. It has been a long exciting haul. The city has been a sea of red and white lately. Day in and day out, fans were excited and worried all at the same time. The buses from Logan with the players aboard are arriving in Boston right now. Crowds of fans have been there all night. The only decision I plan on making today is what Red Sox shirt I'm going to wear to work. None of us got a lot of sleep. No one cares. We are off to work today and we all have smiles on our faces. The downside, if there is any, is that the street fans still misbehaved downtown last night, with a pretty silver sports car smashed in, and bottles thrown into the crowd. An ironing board was thrown out from a hotel window. Police formed themselves into lines as barriers, keeping the crowds of fans spilling out of the bars away from Fenway park itself, and still had to use tear gas and pepper spray. I am horrified at that. We saw a picture on TV of fans lighting bonfires. What neanderthals they must be down there. I'm just ashamed of all of them. Going to jail or the hospital instead of celebrating just seems so stupid and it is such a great day for us, why ruin it? But today we celebrate and forget all our woes of the past. World champion Red Sox! What a great day! Have a great time at Fanfaire in New Orleans Mike and Michelle!!! Woot!!! Curt Schilling. The more I read the more I like him. Another day, another WIN for the RED SOX!!! Oh ho hum. Who wants to talk about life, when the Red Sox are winning! There are only two subjects worth thinking about right now: when am I going to get rid of this awful cold from hell, and the Red Sox. I went to a meeting in downtown Boston this morning wearing my Red Sox sweatshirt jacket. I figured, if not now, when? So, I fit right in with the other folks who have caught Red Sox fever. The game was wonderful last night, Pedro did a great job of pitching, and it all went our way one more time. I heard a sportscaster say, "If the Red Sox are winning, how come nobody feels happy?" 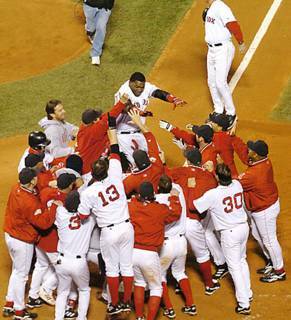 Boston fans are incredibly proud of our team, but Boston fans have too many bad memories to erase to be naively happy. We are sophisticated happy. We are trying to figure out what elation feels like. Happy is a new idea, and needs some exploring before we will give in to it. We are not at all like St. Louis fans. We are not clean and neat and our hair is not recently barbered and blonde. We don't sing country songs, or wear bright fright wigs, or sit with our cute knit hats and gloves on and clap like ladies. We stand up, stamp our feet, yell till we are hoarse, shout, boo, pound on the walls, get Red Sox tatoos and let our hair grow into dreads--and a few of us even push a few cars over after games for good measure (ouch). We are NOT about to sit back and be polite like those St. Louis fans. Did you see their faces last night? Pure dejection. That is a feeling that Boston knows well, but even facing loss, our fans still liven the place up with shouts and boos. For sure you are going to hear from Boston fans. They will not go down politely. In fact, we are not going to go down at all. Sox RULE!!! On one side I am very happy to be feeling better, and on the flip side, I am upset that I have been coughing so long and have had so many nights when I woke up coughing every 30 minutes or so. A recent call to the doctor finally resulted in the nurse saying "we will have something for you at the druggist." Whatever it is, I will take it, but it would have been nice if she had been a little more specific, and it would have been even nice to get it four days ago when I was really sick in bed. So, people in my office are evading me, and I'm careful not to touch any one else's food. How George is going to keep from getting this I do not know. He has been a real prince in trying to take care of me and very patient with his sick little buddy. It is hard to be at work without much sleep, but it is good to be at work rather than home sick because life is more interesting when I have lots to do and people to talk to. And the lunches are better. Red Sox fever will hit our household again tonight when they play the St. Louis Cardinals. They say that Curt Schilling has given red sock a whole new meaning. I thought this article was interesting, these sportscasters are so caustic sometimes to make themselves heard, and of course on the flip side, I am still a Curt Schilling fan no matter what he says. I am going to wear my shirt and hat and cheer them on tonight as long as I can stand it. This and that, back and forth, flip and flop, yin and yang. There are two sides to everything, and lots of choices out there. Backwards and forwards, it is what makes the world go round and what goes around comes around, we all know that. May the circle be unbroken. Cheers all. Go Red Sox. You gotta love these Red Sox. They are so appealing, so scruffy, beat up, with too much hair, and so much heart. They play scrappy, make errors, laugh it off, and WIN again. They are amazing and I have had a lot of fun watching their games and reading the sports pages. I have really come to be a complete Red Sox fan this year. Curt Schilling said yesterday that when he woke up he couldn't walk, and he thought he would never play last night. Another cut and paste on his ankle keeping the torn tendon away from the bone on Saturday made his ankle bloody and sore and the extra stitch they added hit a nerve. After they fixed that he said it felt like a miracle and they numbed it with painkiller injections and he pitched six wonderful innings. Wonderful because there wasn't a disaster. 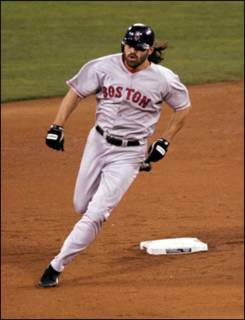 With the Red Sox, you drag out every superstition you ever had, and rub the rabbit foot and keep your fingers crossed. It is the sheer terror of defeat that makes us so happy to see them in the World Series. The Red Sox know disaster as well as triumph, and Red Sox fans are for the most part cautiously optimistic. In Meriam Webster's dictionary CAUTIOUS implies the exercise of forethought usually prompted by fear of danger. But, win or lose, we love the Red Sox, and this particular bunch of guys really has us caught up in Red Sox fever. Back at work today and happy to be amongst people again, although I am staying in my office so not to threaten other people with my hacking cough. The new cure for colds is Veryfine Fruit2-0, a concoction of flavored water that is just right for sore throats. It has no calores, no caffeine, and has saved my life the last few days. It is made in Littleton, Massachusetts, and George and I took a trip out there and bought four cases of the stuff at half the cost of the grocery store. It is my newest obsession. So, keep those cards and letters coming folks! 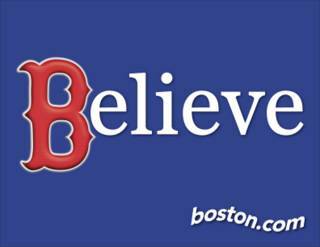 Happy to have you on the blogger wagon, Ixsta, and the Red Sox are going to win the World Series -- BELIEVE it! This past week I had more than the normal amount of time watching TV during the day. Out of 264 channels, there was nothing on. One afternoon I watched 3 very enjoyable hours of the Biography Channel. The first on Tom Clancy, the second on Stephen King, and the third on Anne Rice. All three are people who I really admire. Tom Clancy has a heart of gold I guess, even thought he acts gruff. Stephen King is just the hardest working writer ever and someone who I really admire for his frankness and his incredible talent, and Anne Rice was married to a poet and lived in Haight Ashbury for years. That in itself is very interesting. She was living there before and during the hippie times. She wrote a book, lost a child to cancer, hated San Francisco, and after a lot of perserverance, she sold her book, moved to New Orleans and wrote The Vampire series. Not an uneventful life. When we went to New Orleans, we visited the bookstore where she does her booksignings when her books first come out. It was a very small bookstore crammed with wonderful books, and I enjoyed being there very much and walked out with a calendar and an armfull of books. I will go back as soon as I can. New Orleans loves their Ann Rice, and the Vampire Lestat is one of the greatest characters ever. Right now, on the PBS station, they are showing a series called Broadway, which is a history of Broadway musicals. I have loved watching it this week, hosted by Julie Andrews and featuring ALL the great shows and players, beginning with the Ziegfield Follies and ending with The Lion King. I especially loved seeing the segment on Sweeney Todd and Stephen Sondheim. Who would ever think that murder, mayhem and canibalism could be made into a musical? This history of Broadway is really fun, so tune in if you can. Other than these two channels, they can keep the other 262. Oh, yeah, the World Series starts at 8 tonight, so a reprieve on the sports channels for this week. You gotta BELIEVE. Go Sox. I have been home for four days now. My "virus", which is another name for a cold, I guess, is now moving out, and I am feeling much better. I can go for hours without wishing for a pillow. Being home, I have missed hearing others talk with excitment about the Red Sox, but have had a lot of time to think about how happy those players must be to have the playoffs over. Being home, I also haven't had to hear the negatives and the criticism about this and that. Red Sox fans are so used to bad news I don't think they know how to act. The Yankees are stunned, and although I am not a Yankee hater, like a lot of Boston fans, it is nice to see our team come from behind and win. 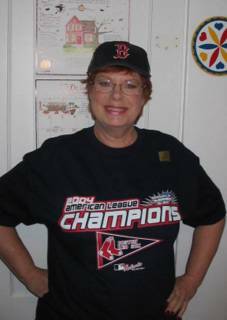 George bought me a National League Champions Red Sox shirt at a sports store who had a grand opening yesterday--how is that for good marketing strategy?-- and we bought two more Red Sox shirts last night to wear on weekends. Why not join the fun? Having a world series to look forward to is good for folks around here, and good for businesses as well, who are selling shirts and party goods and extra groceries for all the festivities. We also have a downside to all this celebration. 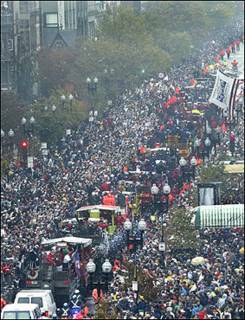 I am horrified at the belligerant crowds that we see around Fenway when the Yankees play and whenever we have something to celebrate. College kids make up about half of Boston's population during the school months, and of course, living in small rooms in dorms and crowded houses, they are anxious to get out in public to celebrate and drink beer and act crazy. College kids cram the bars around Fenway. It is a dangerous combination, drinking and being young. The "party" activity around Fenway often gets out of hand. At the Super Bowl celebration, they tipped over cars, and a young man got killed. Police label them thugs, they have video cam pictures of these kids doing it, and they say they find them and expell them from school. This week, the police were there in force, because they had been criticized for NOT being there after the Super Bowl, and they had cannisters of pepper spray which they shot into the crowd. One "projectile" from this spray hit a girl in her eye, and she later died. Shooting anything into a crowd seems very irresponsible. They also showed police using force to push kids down the street. The kids, of course, were not cooperating. The truth about this is that if you push someone, they usually push back. A young woman died. It is a shame. There is a cloud hanging over the celebration. The police department has accepted the blame, but say the rowdy crowd is really at fault. It is not a good place to be, out there where they are climbing up the outside walls of the empty ballpark, or tipping over and setting fire to cars. One kid climbed up the backside of the green monster - the high green wall at Fenway-- fell off and was bleeding from the head. These alcohol-fueled pranks are life threatening, but kids don't get it. No one could get to him to make him stop. This young woman was in the wrong place at the wrong time. But no one should be in that area when cars and burning and the police are in riot gear. This is not war, it is a victory celebration of a baseball game, for goodness sake. Thousands of university students live in close proximity to Boston, and thousands are cramped into tiny spaces, with incredible pressure put on them to succeed. Add to that the fact that binge drinking is close to the norm at colleges these days and Boston has a problem. More drunk kids than usual. They are from everywhere in the world, but they are ours for as long as they are in our colleges. We are the ultimate college town. I am very concerned about young people on college campuses. It is their first time away from home, and they have a lot to learn, and not just from books. I was appalled when I visited my son's dorm for the first time and saw the 12 steps of Alchoholics Annonymous on the dorm elevator wall. It is not something that I thought would be so public. College is a time to have fun, to make friends, to learn...not to gaze at a 12 Step Program mantra every day without a choice. AA is wonderful, don't get me wrong, but it is usually anonymous and quiet and a place of refuge and hope for folks who are admitting they have a problem with alcohol. To post those 12 Steps on the wall where people have to read them whether they want to or not seems to trivialize them. So, Boston won, and a young girl is dead, and the fans are rowdy as usual, and the bars still serve beer like it is water, and we probably haven't learned anything. The police are having meetings and press conferences, and we have the World Series coming up and the bars are still there. After that, we have the Patriots, and...maybe another Super Bowl. And we still have 100,000 college students in our town who can't wait for the next celebration. May God watch over us. Oh yes,... Go Sox! Home sick, but the Red Sox WIN! I have having a hard time with this virus I caught. I wouldn't wish it on my worst enemies dog. But, I woke up to turn on the TV and find out that RED SOX WIN!!! That is a very good thing. The whole team stuck together, worked it out, played well when they had to, overcame a lot of obstacles and came up to the top to beat the Yankees. Last night after the game, when an interviewer asked Pedro "whose your daddy now? ", Pedro answered "God is my daddy". 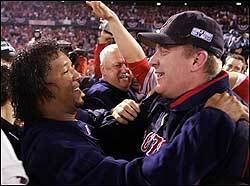 I couldn't be happier for Curt Schilling and the Red Sox team. And Stephen King was on TV this morning saying "there is no curse". This is a fun day for Boston. George is going to buy me a Red Sox shirt today. Maybe that will chase the virus blues away. Last night, Curt Schilling was the lead off pitcher for the 6th game of the Red Sox against the Yankees. He had an operation to stitch the torn ligament to the bone in his ankle in order to play this very important game. Reebok had made him a special pair of support boots, so people expected to see those, but he was not wearing them. As they panned the camera to his right ankle, you could see the rather large spot of blood above his red sock. It was pretty amazing to see, and thrilling to know the effort he had put in to make sure he could pitch this game. No one is talking about the details of the operation, but he had them cut into and stitch his leg to make sure he would be there for his team. Now, that's something! The Red Sox need every pitcher they can get, the Yankees are a great team too, and it is a battle to the finish. Neither club knows how it is going to go tonight. I predict that Red Sox WIN. It is time. We deserve it. We outplayed the Yankees the last three games, and we can do it again. Heart wins! If nothing else, these playoff games have made me a big Curt Schilling fan. He is a truly great guy, and I like everything about him. He gives a great interview, is not pompous or silly, and he is still interesting. He wants to win and he said that being part of this team is "really special". He is special too. Even if he didn't play Everquest, I would like him, but that is just frosting on the cake. Curt Schilling knew that he was needed if we were going to win last night, and he pitched 7 terrific innings with a bleeding ankle. Wow. He is one courageous fella. This morning the local Boston station had a short interview with his wife, dressed in a very handsome hat and scarf, out in front of Yankee Stadium last night after the game. She too was amazed at her husband's dedication, saying "I saw the stuff oozing out of his ankle this morning and I couldn't believe it." This Red Sox team is really a team full of heart and guts, and the excitement is so overwhelming it is hard to watch the games. More than once I have hidden my face in my hands rather than watch the next pitch. One more night of this. Go Sox!!! As a child, I was plaqued by sore throats and strep throat. My throat is my Achilles Heel. So, today I am home with a sore throat. Saturday I worked at church, and got very tired in the evening, and tried to recover on Sunday, but I still didn't feel well, and took a nap, which is rare for me. Now I know. I was getting a cold. We will not call this the flu, but it is more than a cold, because my throat is so sore and raw it is hard to swallow. Speaking of flu, it is pretty sad that the elders of America have gone into a panic over flu shots. Elderly people are pretty interested in flu shots, and I hear about hers from my mom every year. I don't think I have ever even had one, but I know that they are important to her. So, when they announced that millions of folks would not get them this year, but that some Stop and Shop stores had them...lines started to form and old people stood in line outside for hours. One woman fell, and hit her head, and died. Several others collapsed. Yesterday, the head of Health and Human Services, Tommy Thompson, said that elders should not form long lines, that everyone who needs one will get a flu shot. But that announcement came five days after the lines had formed. Five days is a long time when you are 80 or 90 years old, worried, and standing in a line at a mall. The reason they want flu shots is that they know they are susceptible to a fatal case of the flu, and they do not want to die! That is enough to scare anyone into standing in line. Speaking of standing in line, I have another point to consider. My mother is 94, and when we go shopping, we notice that there are NO chairs anywhere in stores. Once in a while, at a Kohl's or Walmart, there is a bench outside. I know they don't want people to sit around, they want them to shop, but it seems that we have forgotten about the elderly and folks who have disabilities, or just sore legs and feet, who need to sit for awhile so they can continue their shopping. Why do we have to be so inconsiderate? Sometimes I have to make a scene to ask a sales lady to please find a chair for my mother while I bring clothes to her to choose. Mother is now 94, and it is only lately that people have started to help her do things. Until she was 92 and had a stroke that affected her eyesight, she was still driving herself to the stores, she would be out in the parking lot of a WalMart lugging gallons of water into her trunk and people would just walk by her. Why don't people stop to help? It is just that we are not used to being considerate, so we rush by with our own agenda in our head, and forget to think about what the other person is going through? So, commit a random act of kindness today and help an elderly person carry their shopping bags. And don't catch a cold! I just read a blog about knitting. She writes: It's hard to tell when the yarn ends and you begin. I know what she means. Yesterday I stopped in at the yarn store and bought some fun yarns for even more scarves. This has got to stop. But I can't help myself. It is so much fun to find the right stitch for the texture of the yarn. I imagine different people wearing them and think about giving them as Christmas gifts, and if they are a little glam for most folks I know, I think about how to wear them myself. Where do I stop and the yarn begin? It is not easy to tell. I have a whole stash of yarns by the side of my chair for all kinds of moods. Right now, since I had a too busy and not so great weekend, I am knitting a scarf in the softest white fluffy yarn, like knitting with marshmallow fluff. It is easy and it makes me happy. Maybe maybe I will find the right person for this new creation and make them happy too. Sometimes, playing a roleplaying interactive game like Everquest, it is also hard to tell where your character stops and you begin. Tonight Mike and I met and did a task together. My first time. It was really great to have him along. 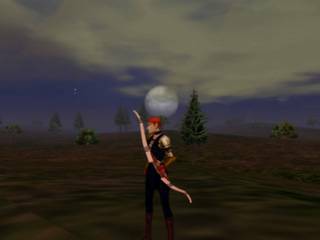 Running through lands of Norrath that others know well, but that I have never seen because I am a coward, he was very patient with me as I made sure I had camoflage, levitate, and assorted spells to ward off the unknown dangers. I am equal to the task, but I don't always believe I am. Self confidence is a real "in game" problem for me. We ended up running through the dragon city in Skyfire, and it was thrilling. Sailing over the red lava rivers, I found the character at the end of the task and got money and experience as loot. I enjoyed it enough that we did another task right after, with much the same route, and the same result. Something that he found too easy I'm sure, but that is the way I like to do things. At the end I took a wrong direction, ran right smack into an evil city, and Loral was for once, terror stricken enough that he typed out "mom!". That may not make sense here, but it was very funny afterwards. Where did Elfauna end and "mom" begin? It is very funny to me, this slip of the tongue. I looked at the word Mom as I was running, and didn't even know what that word meant. I wasn't expecting him to call me that. Elfauna quickly changed course and lived to tell the tale and will be happy to do the simple tasks for now. I do not have to immediately move onto the next thing in order to feel challenged. Maybe that is why I have knitted 20 scarves lately. I like things in multiples of more. Thanks, Michael. I had a blast. I love Saturday mornings when I don't have to go anywhere. Even housework seems like a fun thing to do when you are used to sitting at a desk most of the week. I guess working every day really makes you appreciate weekends. This Saturday I am going to knit, clean house, and go to a church family night to serve pizza and salad and desserts. George and I are in charge of setting up the dinner buffet. Oooh, the salad--I'm supposed to bring one. I have to run! Curt Schilling isn't going to be able to pitch this series, and it is going to rain bloody murder tonight during the time the game supposed to be on. It is dark and dreary this morning, and the mood around Boston is...subdued. I know we are all very hopeful that the spirit of Fenway will help bolster our Sox enough to win tonight...if they play...but without our star pitcher it ain't going to be easy. I'd say the outlook is downright gloomy, but I'd probably be run off the road if I said that in public. Curt Schilling is one super fella, and I hope he gets over this fast. There's always next year. Go Sox!!! On the Everquest front. I woke up at 3 a.m. thinking about the items that were given to me by a fellow player when he left the game, and then asked for them back when he decided to return. I don't blame him at all, and stuff is only stuff. But, the more I thought about it, I realized that I missed that stuff and had a bank full of money. So I shopped at the bazaar until 4:00 a.m. when all the vendors are there selling their wares and bought six of those items from vendors. I now have my big axe of the scions, my magnificent glimmering recurve bow, my amulet, my architect's scepter,a chitinous belt and an ice forged helmet. Elfauna rides again with all her beautiful gear. See you tonight everyone! Yesterday George bought five tickets to his company's United Way Raffle and won the Baking Basket. It is just the basket that I would have bid on. The other baskets were "wake me up" filled with coffee, something with a lot of bottles of liquor and mixes(hehe), and another one called "barbecue" with a small keg of beer and barbecue things. I am very very happy with the "baking" basket. He said it was by far the largest of them all--and he had to have help taking the two huge baskets to his car. I was amazed when I saw them. They are filled with all kinds of things for baking: bundt pans, rolling pin, flour, sugar, spices, cookie sheets, vanilla, cookie mix, cake mix, whisks, chocolate chips, sifters, pot holder mitts, aprons, a whole long list of things to make goodies with. I really can hardly believe all the stuff that is in those two baskets. They were certainly generous! He had the biggest smile on his face when I came home and he asked me to come to the livingroom. His secretary says he owes her some cookies, since she was the one who talked him into the buying the tickets. Woohoo! I can't wait to tear into the baskets and bake something. Just in time for Thanksgiving, Mike! Yay! George bakes wonderful cookies. People love his cookies and I love to bake and have a brand new Kitchen Aid 6 quart mixer and this basket could not find a home in a better place! Lucky George almost always wins the raffle when one is offered. He has won the raffle prize at the flying field picnic so often he had to stop buying tickets because it was embarrassing. So, see you in the kitchen. 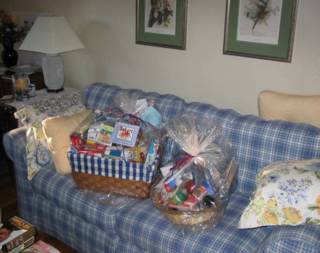 Baskets George won in yesterday's raffle. I couldn't watch last night. The game went south from the beginning. Curt Schilling has a hurt leg, and I don't think he should have played, but what do I know? They said he has a big heart and has come back before...so they left him in. But his leg injury made pitching his game impossible. He said today if his leg doesn't get better he may be out for the series. That is a huge disappointment. It just seemed from the first pitch that everything was NOT going to be all right. I couldn't even stand to see it, and I went to bed early. Then I woke up at 4:30 a.m. to turn on the TV to find out the details. In the end, the Red Sox made a valiant effort, but not enough to win against the Yankees. Tonight is another night. Not too many people in Boston will be watching the debate, I know that. Go Sox! 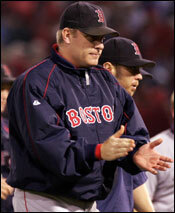 Tonight Red Sox pitcher Curt Schilling takes the mound against the Yankees in game one of the ALCS. I'm a big Curt Schilling fan because he plays Everquest, and is evidently really hot for games. Woohoo. I also am a fan because he is a hard worker, gets to the ball park 5 hours early, does his homework on the opposing team and writes down his pitches. And, he is a really nice guy. I think that it is really great that he knows Norrath and it seems like a perfect place to be when you have a job that takes you on the road all the time. Here is the interview he gave to Allakhazam. This intense rivalry is going to make this game pretty exciting. I can't wait to watch it. Go Curt! The folks at Redeemer have really responded to the idea of filling bags with the specific foods that the food pantry has asked for. Someone gave me the idea, and since I am not shy, I made an announcement one Sunday, called the food pantry to find out what they needed most, got the bags donated by a local grocery store, and then labeled the bags with foods like macaroni and cheese, cereal and canned fruit. 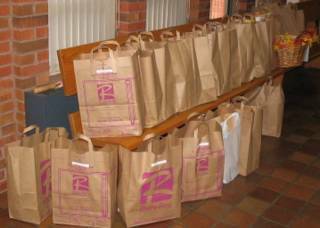 Every Sunday, the back of the church is filled with bags of food. Our World Hunger Kick Off event is a big success, helping people in our own community who need help feeding their families. Donations for the food pantry from the generous folks at Redeemer. 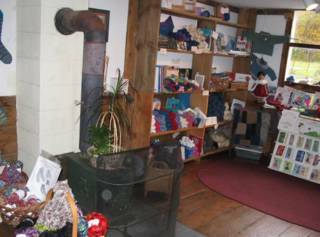 A cozy shop called The Wool Room, in Antrim, NH, owned by my friends Anne and Brian, where I bought my first spinning wheel. I feel really happy to have a three day weekend, and I don't have any trouble knowing how to spend it. 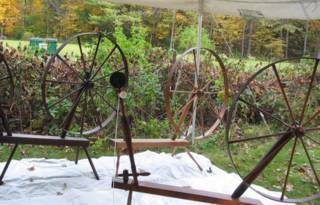 A trip to the flying field, a trip to the New Hampshire Wool Tour, and a great time playing bells on Sunday morning. I'll pass on the sugar, thank you.